length overall 8 1/2 in. (216 mm) blade length 3 3/4 in. (95 mm) blade steel 8Cr13MoV length closed 4 3/4 in. (121 mm) cutting edge 3 3/16 in. (81 mm) weight 4.25 oz. (121 g) hole diameter 15/32 in. (12 mm) blade thickness 1/8 in. (3 mm) handle material G-10 byrd Cara Cara2 G-10 Handle Upgrade alert! 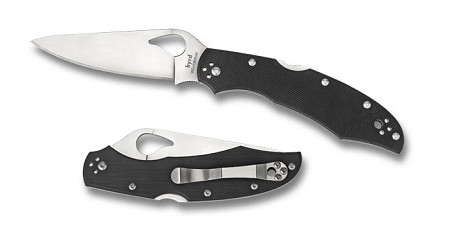 byrd knives are the subject of a number of engineering refinements for 2010 with improved ergonomics, four-way clips and full-flat ground blades. Like Spyderco knives, byrd knives are subject to our penchant for C.Q.I. - Constant Quality Improvement. As manufacturing processes and material availability improves, so do the byrds. The newest evolution of the Cara Cara is the Cara Cara2 with a G-10 handle. It has a full-flat ground high performance 8Cr13MoV blade. Shaped like a “comet” the hole in the blade symbolizes quality and careful manufacturing tolerances. On the blade’s spine is a group of crosshatching called jimping. Jimping enhances the thumb’s grip on top of the blade making cutting slip-resistant. Available for the first time with a four-way clip that carries tip-up/tip down or left/right-handed, it attaches inside a pant’s pocket where it rides deep and confidently. A finger choil enhances the ergonomic G-10 handle adding comfort and control. Mid-positioned back lock has a David Boye cut away dent, a safety feature allowing the handle to be tightly gripped without unintentionally releasing the lock.